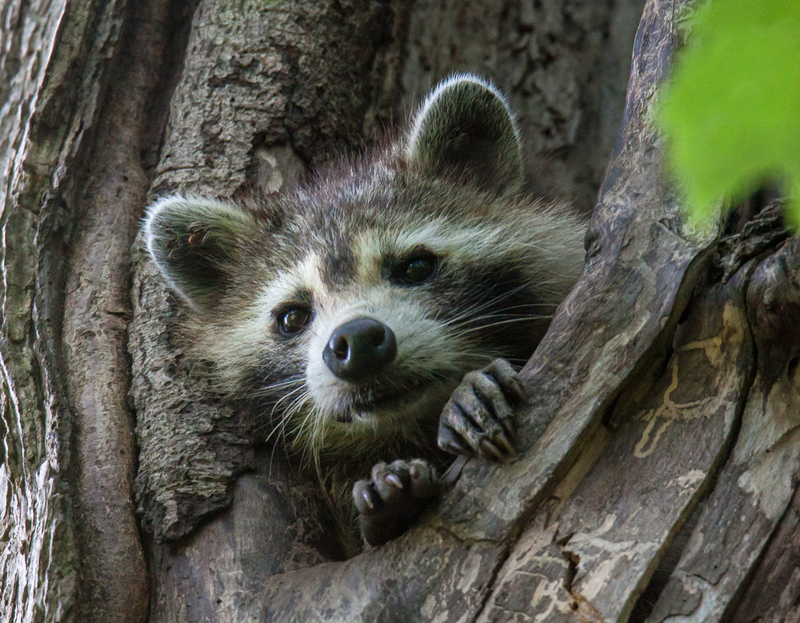 As I was wandering about in the woods early yesterday morning at Huntley Meadows Park, I inadvertently spooked a raccoon (Procyon lotor) that was stretched out high above me on a tree limb. The raccoon quickly climbed inside the tree, but it seems like it was overcome by curiosity and poked its head out to get a better look at me. A sharp-eyed viewer of my posting of this image in Facebook noted that the raccoon seems to have a problem with ticks, with several of them visible in one of its ears. 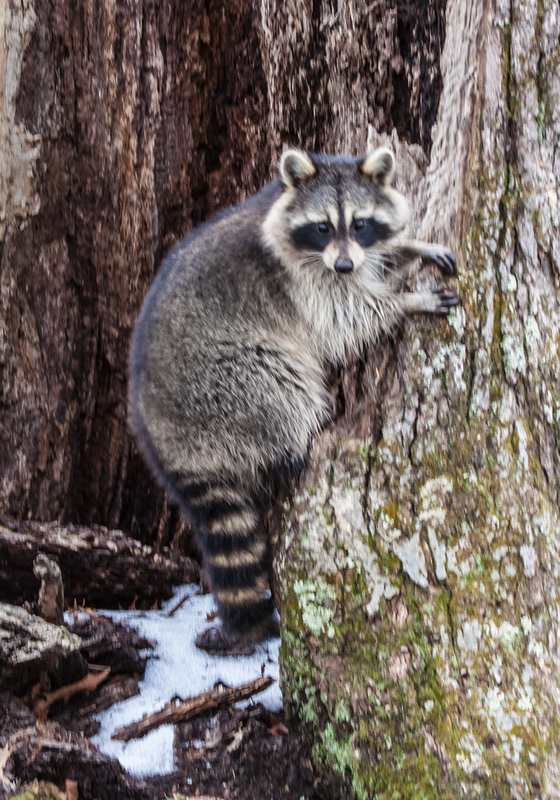 I know that raccoons are notorious for carrying rabies, so I kept a close eye on the raccoon and was ready to move away if it had made a move to climb down from the tree. As I was walking through the woods on Friday at Huntley Meadows Park, I noticed something white among the leaves on the ground. 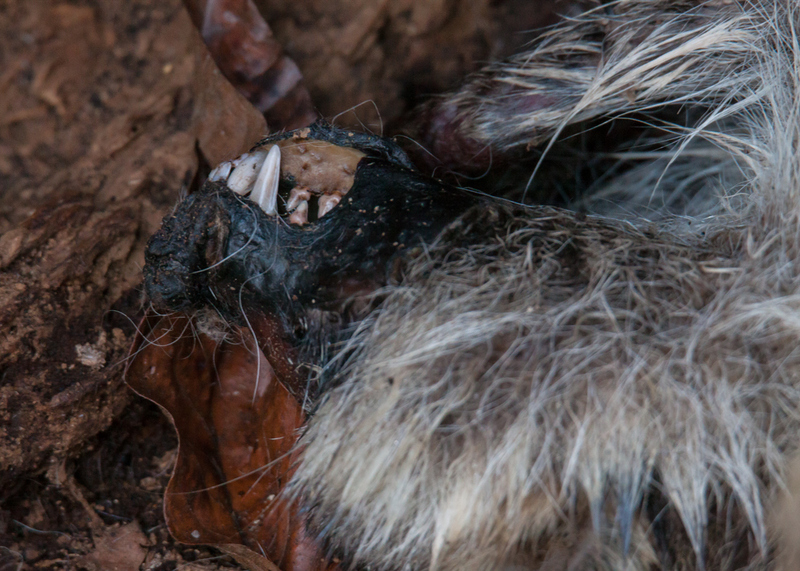 At first I thought it was just a mushroom, but upon closer examination it turned out to be the upper portion of the skull of what I am pretty sure is a raccoon (Procyon lotor). There were no other bones in the area, nor was the lower jaw anywhere to be seen. I don’t know much about animal anatomy, but I was fascinated by the shapes and contours of the skull, a kind of natural and organic sculpture. It was intriguing as well to examine the sizes and shapes of all of the different teeth. We visit our local parks and wildlife refuges for a short while and return home, forgetting sometimes that many of the creatures we observed live and die within the confines of these small (or not so small) areas. As I wander through Huntley Meadows Park, I see signs of this entire circle of life. Lives have ended and, as we move into spring, new lives are beginning. Whenever I come across skeletal remains, a clump of feathers, or other evidence of the death of a bird or an animal, I cannot help but wonder how the creature met its demise. Was it a predator, old age, sickness, or starvation? Life can be harsh in the wild, especially in the winter. As far as I can tell, the animal in the first photo is a raccoon (Procyon lotor). Several months ago a fellow photographer mentioned that he had seen the dead body of a raccoon inside a hollow in the trunk of a fallen tree. I thought that predators would have dismembered the body by now, but instead it seems to be slowly decomposing in its sheltered position. The skull is the second photo is that of a White-tailed Deer (Odocoileus virginianus). 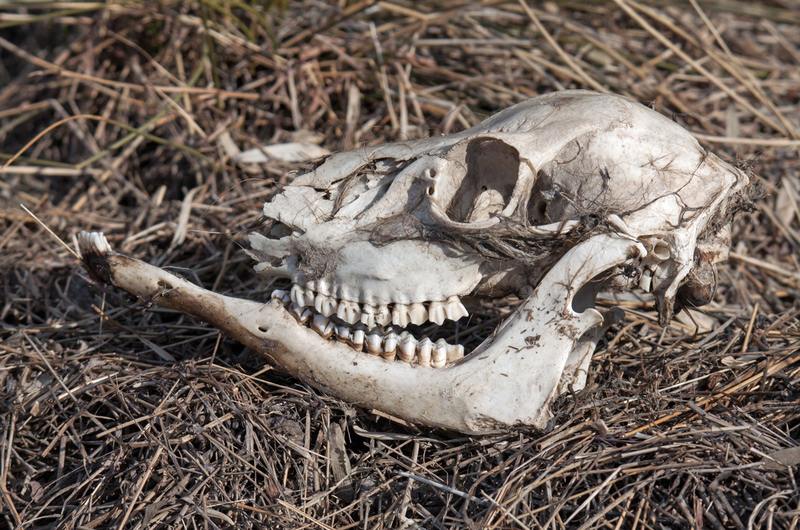 Other body parts of the deer were scattered about in the same area where I spotted the skull. There are concerns that the deer population is too high for the park to support, so there is a chance this deer died from starvation. I know that these photos, especially the first one, are pretty graphic and apologize in advance to those who may have found them to be excessively disturbing. Yesterday, I returned to the pond where I had previously seen the river otter, hoping to see it again. As I stood silently at the water’s edge, I heard something pretty big moving about in the underbrush, something that seemed to be bigger than an otter. I was surprised to see a raccoon emerge—generally they are nocturnal and previously I had seen them only at twilight. The raccoon seemed to be rooting around, looking for food. He didn’t seem to be aware of my presence and as I watched it move about, I managed to get a few clear shots before it moved away into the deeper brush. It you are of a certain age, you remember the fun little Beatles song “Rocky Raccoon”—every time that I see a raccoon, that song comes to mind.